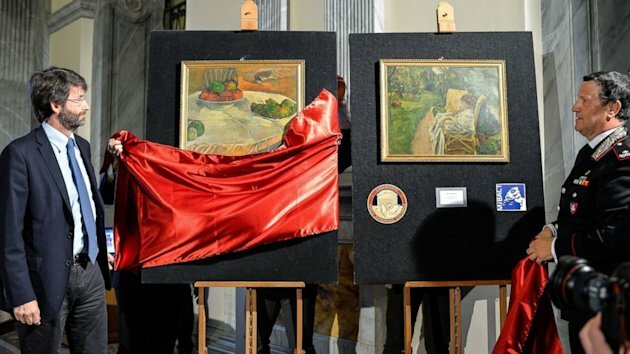 A pair of stolen masterpiece paintings valued at $50 million have been recovered after being bought at an auction for $25 and hung in an auto worker’s kitchen for years. The masterworks were described as Paul Gauguin’s “Still Life of Fruit on a Table With a Small Dog” and Pierre Bonnard’s “The Girl With Two Chairs.” They were stolen from the home of a British couple in 1970. The auto worker’s son had decided to sell the paintings last year and that is when they came to the attention of police. The paintings were stolen from the collection of Sir Mark Kennedy in England on June 6, 1970. Kennedy and his wife died without heirs, and without ever knowing the fate of their paintings. Press reports from that month say that three men, one posing as a policeman and the others as burglar alarm engineers duped the housekeeper, telling her they were checking the alarm system. While she made them a cup of tea, they removed the paintings from the frames.